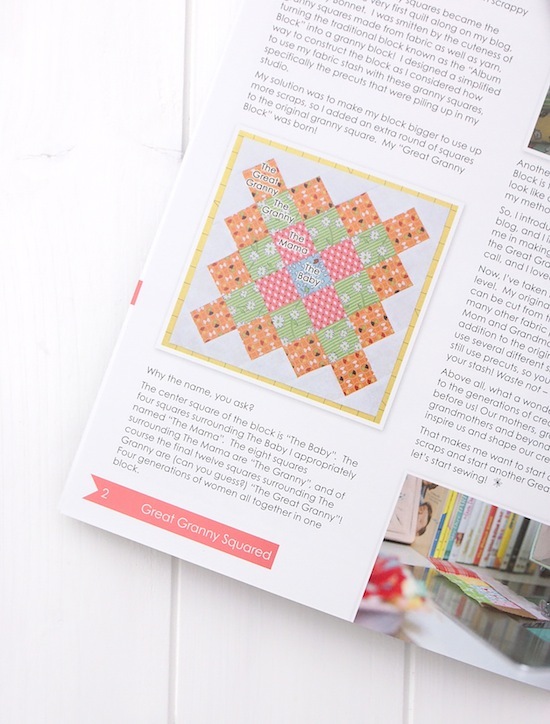 MessyJesse - a quilt blog by Jessie Fincham: Great Granny Squared Book Giveaway! Great Granny Squared Book Giveaway! I loved reading about the 'great granny' name too. The baby, the mama, the granny and the great granny! So cute. I just love that. It's smaller than Lori's first book Quilty Fun, but packed with some great projects. It includes complete instructions for two quilts, a table runner, a pillow and two embroidery designs for use as quilt labels. So comparing the price tag of $13.95 for a multitude of projects versus a regular one-off quilt pattern at the same price it's really great value! And as always, Lori provides really clear instructions and diagrams to follow along. As well as the all important happy vintage photo's of Lori's colourful home dotted throughout the book! Coincidently, Lori's latest line of fabrics is called Vintage Happy! see what I did there ;-) Congratulations to Lori on another fantastic book! 1. Become a blog follower (if you aren't already) and leave a comment on this post. 2. For an additional entry you can re-post on Instagram with the #greatgrannysquaredgiveaway hashtag and tagging me @messyjesse1. Leave a comment to count additional entry. I love quilting but have too rely on scrabbling from a friend for patterns as the books are too expensive too buy. Would love too win this one and develop my skills further. 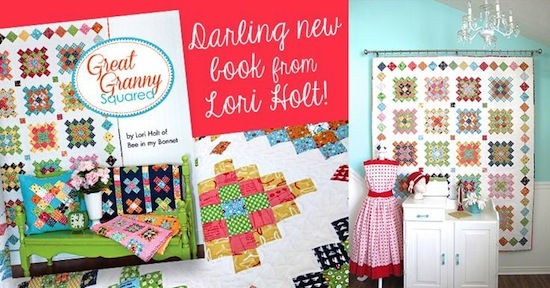 I love Lori's Quilty Fun book so I'm sure this one is a treat also. Thanks for the chance to win. I'm a follower! I'm a follower - what a great giveaway. Thank you for a chance to get this book, it looks great, I'm a follower. Just become a follower! The book looks fabulous! I LOVE Granny Squares...and would LOVE a copy of this gorgeous book even more!! Thanks! I already follow you! I'm a follower! Looks like a great book! I'm a follower via Feedly! Enjoy your blog...love the fabrics you pick for your quilts! I have been wanting this book ever since I first saw it. Thanks for the chance to win it! Already a follower and love the look of this book! Oh, I love crocheting granny squares, too, so trying them out in a quilt surely would be fun! I'm a follower on Bloglovin :). This book looks like a good one thanks for the chance. I love Granny Squares too. It's on my quilts to do list, this book would be awesome. This look like such a great book! I already follow your blog. I loved Lori's first book so I'm sure this will be just as good! 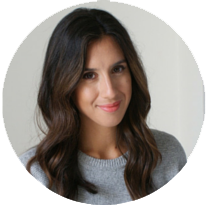 I love your blog and read it daily through bloglovin. I follow you on Instagram but don't know how to repost there. Too bad. I've made some of Lori's gg squares already but not enough to put into a quilt yet. Oh, this looks so cute! I'm a follower. I follow you here and on Instagram & I love it! I get inspired everyday! I already follow your blog with bloglovin. The first quilt I made was granny squares. Thanks so much for this giveaway. 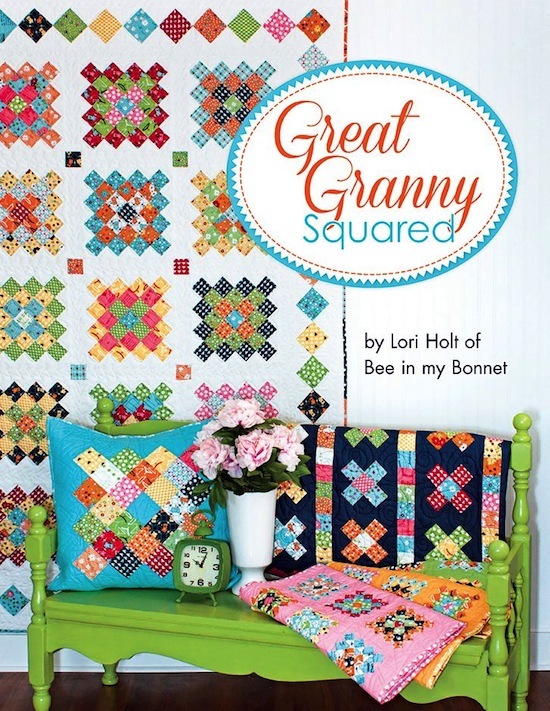 I've not made a granny square quilt yet, but I love them, and Lori Holt is so inspiring! So is your blog, which is why I'm a follower, with Bloglovin! I became a follower by email. I love granny squares! Thanks! New follower here. I love the granny square. I signed up to follow via email. If I don't win your contest, the book is on my birthday list, but I don't really want to wait until June! Thanks. Already a follower and love your blog - and quilts! Would love to win! Thanks for the opportunity....I'm a follower! Yes, please! I absolutely love your blog - I am a beginner quilter and I am so inspired by your blog - love your style so much! Count me in - that book looks lovely! ....and of course am a follower....!! Oh I'd love to win this book!! I am a follower of yours. Love your blog and would love to win the book! Like so many others, I have bought books and adore reading them but find that they are now just so expensive that I have to stick to what I have got or make my own up. Would love to win this book to add to my, admittedly, small collection. Fantastic giveaway! I'm a follower on bloglovin. I'd love to win this book! I've been working on basic granny squares for the past weeks and would love some guidance on a few issues/questions I'm having. I am a fairly new follower via email -(gmanleyatgmaildotcom) and confession time, I have never made a granny square quilt block - plenty of crocheted granny squares but never a quilty one :O I love Lori's fabrics and patterns and would love to figure out how to make a sewn Granny Square. I do not have instagram though so only one entry. Thanks for the chance. I have also uploaded the photo to Instagram (hoping I did it right!). I already follow you on my Feedly. I adore granny square quilts. Made one, and want to make another one in entirely different fabrics now. I already receive your newsletter via email, I would love,love,love to win a copy of Lori's book! I'm already a follower. The book looks like a lot of fun--love Lori's designs! I'm a follower on Bloglovin' :-) Love Granny squares! I'm already a follower and haven´t made a granny square block.the book looks great! I'm a follower! ;) love the granny square pattern, I think I need to order more Pam Kitty Picnic from you! I love granny square quilts. This book looks like a real winner. I follow on bloglovin. I am a very joyous follower on bloglovin....good luck one and all!!! This book is SEW sweet!!! I am a follower on Bloglovin' - this book would be a great addition to my quilting library. I am a follower of Your blog! Thanks for the giveaway! Hip, Hip, Hooray!! Finally a give-away that I can enter, (most of them seem to be in the US) I'm soooh glad I found your blog Jessy. I'd love to be accomplished enough to whip up a Double Irish Chain super quilt or your beautiful and inspiring feathery Christmas star, I'd love to be, but I'm not; but a granny square that I didn't have to crochet? that I think I could manage, I love looking at the way clever designers put blocks of fabric together to create magic. Thanks for hosting it. I am a follower. I love Lori's Quilty Fun book and I just finished my first granny squares quilt! I would love to add this book to my library! Thanks for the opportunity! I follow you on blog lovin. Would love to win this book! I am a follower of your blog. I would love to win Lori's new book. Thanks for the chance. I love everything by Lori Holt AND everything you make! Of course I follow your blog!! And, I follow your Instagram feed!! Can I just say LOVE them both! Thanx!! On IG, I am yardgrl60 just in case you want to see! Love your blog!! And your Instagram! Would love to win this new book! What an Awesome book!! Thanks for chane to participate WITHOUT being a FaceBook person! :) YAY!! There's so many designs that you can make with granny squares. What a treasure it would be to have this book. I followed with email. Thanks. I Love granny square quilts!!! I am trilled at the chance to win this beautiful book!! Thank you!!! New follower, hoping to win! Jesse- you are so talented! Thanks for sharing your sewing adventures! gfc follow as rodney or debbie jackson...........it isn't working so I can't confirm which. Thanks. I'm a new follower. I'd love to win the book. Thanks! Love your site! Great vintage sheet combo with your beautiful Irish chain! O my! I'm a follower for don't know how long...love this! I love all things Lori holt! Been following her for a long time! Thanks for a great giveaway. I'm a follower on Bloglovin! Love anything Lori Holt does! My sister would love this! She's the quilter in the family. I am loving your blog, from the name to your lovely irish chain quilts! Great giveaway - I follow with Bloglovin. Great giveaway, I am a follower and I have shared on Instagram!! Hello! I follow your lovely blog on Feedly. Thanks for the Giveaway offer. I am a new follower to your blog. Anyone who follows Lori Holt is someone worth following also, I say. I would love to win a copy of this book. It looks like so much fun. I'd love to have this book! I have all the stuff for a granny sq quilt but just need to sit down and make it. ;) Thanks for the chance to win! I'm a blog follower. following and loving this giveaway! i am a granny and i love granny square quilts! What a super prize - something for me to get my teeth into once I finish making your herringbone multi-coloured quilt. I love it! HELLO, what a neat giveaway! This is such a lovely blog, I've been following via Feedly for some time...It's my Gran's 90th birthday this August and I'd planned to make a granny square quilt for her. This book would be a perfect aide! :)...Thanks for the giveaway! Awesome book! I follow via email: ksmith8@emich.edu. Thanks for the chance to win a copy! Love all your mini's..just finished the umbrella one. Thanks for the chance to win!